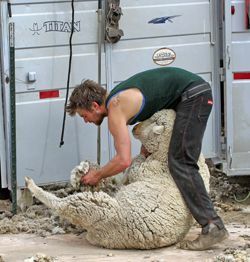 This professional sheep shearer from New Zealand was part of a team that efficiently separated a herd of Paradise Sheep from its wool. Photo by Dennis Rank. Copyright © 2010 Pinedale Online. All rights reserved.